As a fellow knitter.. you know how it goes. We buy yarn with the best of intentions. Beautiful expensive skeins. But sometimes they are so beautiful we are afraid to use them for fear that they will be wasted on an unworthy project. And yes...I'm using the word "we" here when maybe I should be saying "I". I guess I'm hoping that I'm not alone in this. Frankly, this happens to me more than I care to admit. And that is what happened with these two skeins below. They were lying in the deep recesses of the stash. 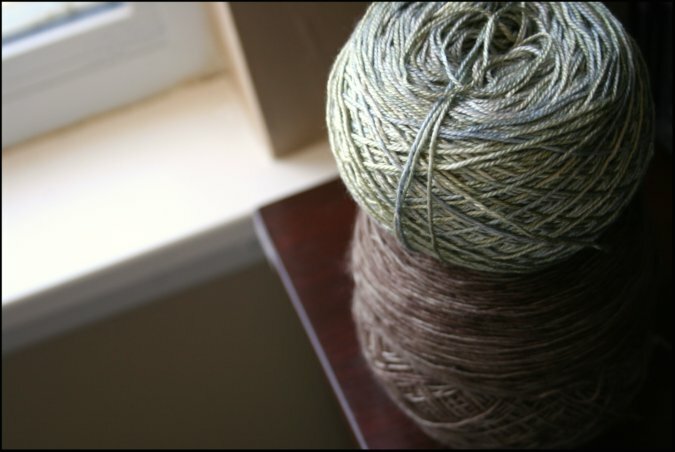 One skein dates all the way back to a 2007 purchase! But guess what? 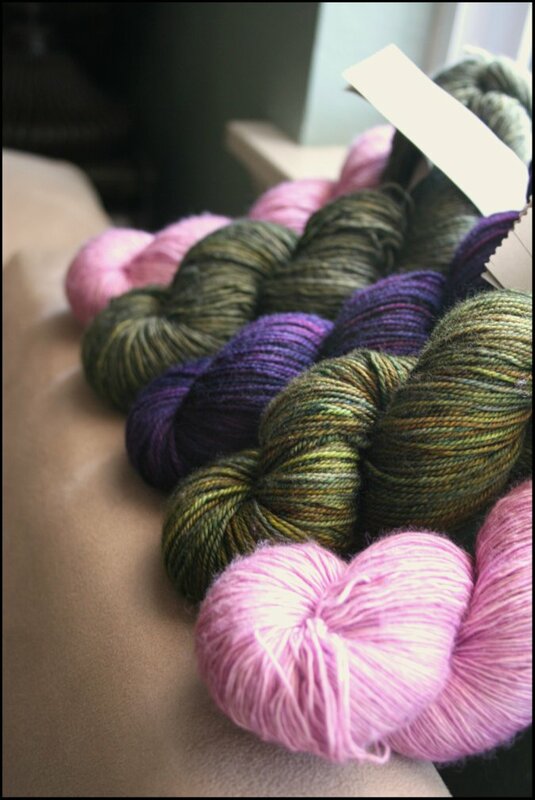 Although I was envisioning each of these gorgeous skeins for their own separate equally gorgeous projects.. I realized as of late that they look awfully good paired together. So that's what I did! 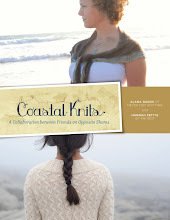 I was able to incorporate both skeins into a design for my upcoming design collection. And I can't tell you how good that feels to lift these two beauties from the dark, lonely depths of my yarn bins. 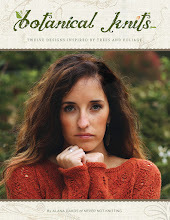 In Episode 52, you heard me mention Pigeonroof Studios yarn. Well.. hear it is! Aren't these skeins so beautiful? These colors remind me of a springtime garden. To enter to win these five beautiful skeins provided by Krista from Pigeonroof Studios, please leave a comment under this post. Remember to please include your contact information. The winner will be announced here on July 1, so be sure to check back then and see if you've won! Drawing Now Closed! Winner is Kristin! Congratulations! The winner of Episode 51's Spud and Chloe Drawing Giveaway is Des! Congratulations! by entering code " nevernot11 " in the checkout process. Click HERE to download the Episode 52 MP3 file. 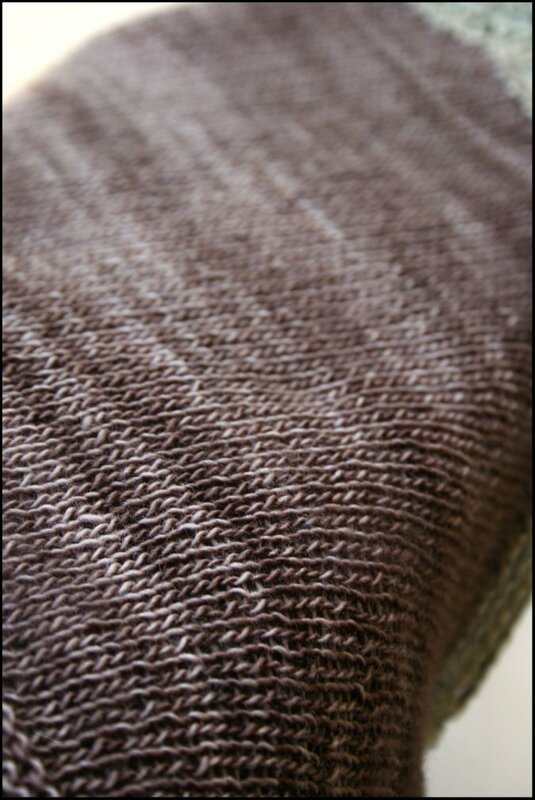 ...Swatching tiny oak leaves in delicious green yarn. Since I'm a lover of all things green and leafy, I'm finding this part of the design process very exciting. 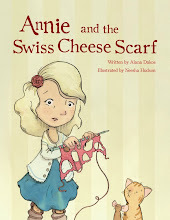 On Episode 51, I had the privilege of interviewing Susan B. Anderson about her latest adorable book, Spud & Chloe at the Farm. This book is seriously so cute. If you enjoy knitting toys, you will LOVE this book. And so will your little one! 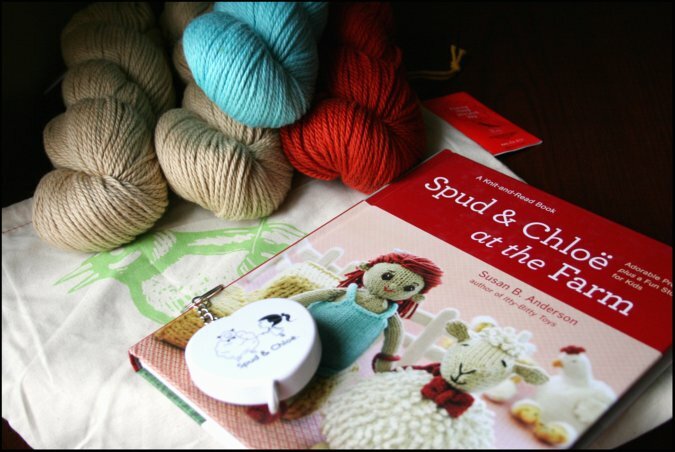 Leave a comment below to enter to win a copy of your very own along with yarn to make the Spud and Chloe characters and a cute themed measuring tape and project bag. 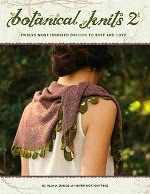 Thank you to Artisan Books and the Spud and Chloe yarn company for providing these fabulous prizes. Also, only one comment per person please. The winner will be announced on my podcast and blog on June 15th so please check back then to see if you have won! **Please check back soon to enter the drawing for Episode 51! Click HERE to download the Episode 51 mp3 file.